Having woken to London's first sunny day in weeks, I considered not publishing this recipe for a warming soup. However, just as one swallow does not make a summer, one sunny day does not mean we are out of these dismal weather troughs yet. So here is a really simple, healthy bowl of 'beans and greens' to get you through the next few days. I have to own up to stealing this recipe a couple of months ago from Dave Cook. He passed on some of his vast kitchen knowledge to a handful of keen amateurs, of which I was lucky enough to be one. Like all simple dishes, it relies on good ingredients. For the 'beans' element, I prefer to soak and cook dried ones for this soup but you could use the bottled Spanish Alubia beans which come in excellent cooking stock. The freshness of packaged dried beans is difficult to judge. The 'best before' date on the packet sitting on your supermarket shelf will lead you to believe they will keep for a year or more. Well, yes they will but the longer they are kept the longer they will take to cook, and they will not taste so good. Italian and Turkish food shops are good places to shop for dried beans as they are used a lot in the cuisines of both countries. For this reason there is likely to be a fast turnover of stock. If the locations are good for you, I can recommend Leilla's shop in Spitalfields or Lina Stores in Soho. 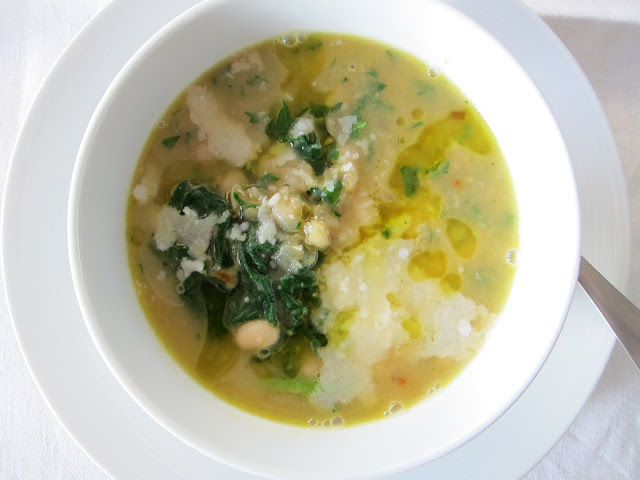 Any white bean will work in this recipe. The 'greens' in this recipe is escarole, a broad-leaved endive which looks a bit like a large, frilly romaine or cos lettuce but it is a bit more robust. Escarole is sweeter and less bitter than its endive relatives with which you might be more familiar. You could use something like turnip tops (cima di rapa) if you blanch them in boiling salted water for a minute or two first then plunge into cold water to retain the colour. As I had some turnip tops, this is what I used for the soup photographed. Soak the beans overnight in plenty of cold water. Drain and bring to the boil in a large pan of fresh water with the whole carrot, celery stick and half onion. Boil fast for 10 minutes to remove toxins, skim off impurities then reduce to a simmer for an hour or more (depending on freshness of the beans). When the beans are soft, discard the vegetables. Remove a quarter of the beans, puree and then return them to the pan. This will thicken the soup and give it a silky texture. Fry the garlic and chilli in olive oil and cook without browning. Add the basil, parsley and escarole and cook for 1 minute to wilt. Add all to the beans pot. Add grated parmesan and salt and pepper. Serve with a drizzle of good olive oil and shavings of extra parmesan.